A bunion is an enlargement of the bone & joint of the big toe (1st metatarsophalangeal joint) often caused by chronic irritation of the skin, joint capsule and bone. Genetic factors play a part in the development of a bunion as do the footwear chosen and the activities most often performed. High heeled and narrow shoes send to place a greater stress on the joint of the big toe and can be a precipitating factor. Dr. Michael Horowitz offers a natural process to successfully treating this bunions. He can help evaluate & diagnose your condition and recommend the best course of action for you. Call Vancouver Orthotics at 604-737-3668 for more information. Bunions can be successfully treated and prevented with the support of custom orthotic inserts. How you ask? It's an issue of biomechanics! Have you considered an alteranative to bunion surgery? Do you experience bunion pain? Did you know bunions can be treated withiout surgery, naturally? 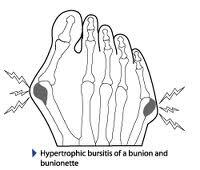 How do you know if you have a bunionette? Should you use a bunion splint? What is a bunionectomy & what is the recovery time? How can orthotics help with bunion removal? Have questions about Bunion Treatment? Ask Dr. Michael Horowitz by calling 604-737-3668 or by filling out the form below.